Rissotto is labour intenstive, involving 20 mintues of constant stirring. Given this, you’d think it wouldn’t be off the cfc menu. Wrong! Like dancing, making rissotto is a courtship ritual, with a tasty outcome. So shut up and stir. Risotto is a groove-thing. The first few times you won’t be sure how you feel about it. Is the texture right? Too much liquid? What is this goop anyway? But then you’ll have this risotto breakthrough moment where you nail the texture (I like mine sticky vs soupy) and you won’t be able to stop making it. I made it twice this past weekend! 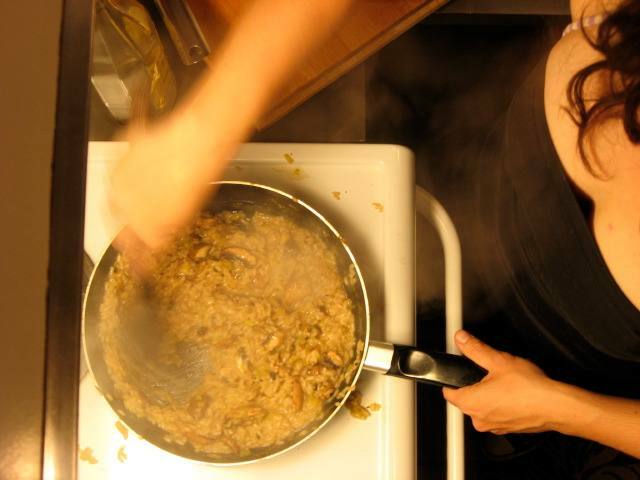 Find your risotto groove! You won’t regret it (neither will your triceps.) The following is my standard recipe. 1. Bring stock and water to a simmer. 2. On high heat, heat oil in large deep frying pan. Add leeks. Stir for two minutes. Add rice, stirring to coat grains in oil. Stir for 2 minutes. 3. Add the white wine and stir until evaporated. Set timer to 22 minutes and start adding the stock, one cup at a time, stirring until liquid is evaporated. 4. With five minutes left on the timer, add peas and mushrooms. Stir until a sticky texture is reached and the final liquid has been absorbed. 5. Turn heat off and let stand for five minutes before serving. 6. Serve into separate bowls and sprinkle with parmesan cheese. 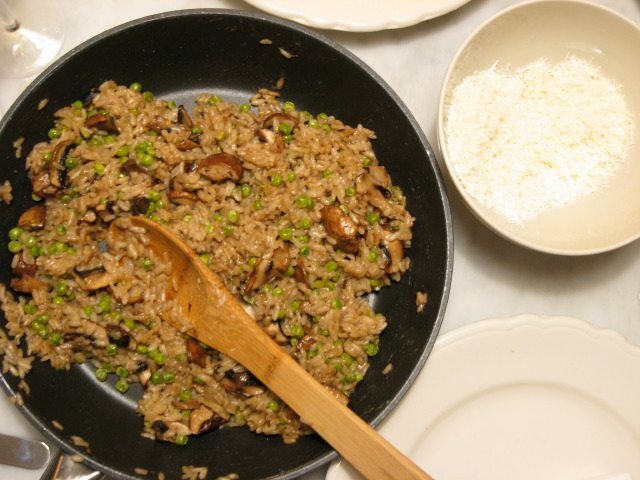 (Note, some recipes call for mixing additional cheese directly into the risotto during the final minute of cooking, but I find the flavours are so strong you only really need the cheese on top, and the diner can mix it in for themselves, as they would a pasta dish. Serve alone or with a simple green salad on the side. It’s also a yummy side dish for grilled meat (like the Cheap and Easy Pork Chop with Lemon) or Italian sausage. Sometimes I serve a steamed veggie on the side, like asparagus or fiddleheads, for extra nutrition and fibre. This entry was posted on Tuesday, June 9th, 2009 at 4:13 pm	and is filed under Uncategorized. You can follow any responses to this entry through the RSS 2.0 feed. You can leave a response, or trackback from your own site.